Generally one hears about the mind-body connection, but is there a mouth-body connection as well? Studies have proven that the mouth shows the definitive symptoms of a disease affecting any other part of body. While examining the mouth, a dentist may see the signs and symptoms and detect the disease before one even knows that he/she has that disease. In that case, the mouth may be instrumental in diagnosing a disease much before its manifestations elsewhere in the body. Also, one can notice how a doctor always first checks the condition of mouth and asks to pull out one’s tongue for the physical examination. In addition, certain diseases and conditions have impact on the oral health, and vice versa. For example, a person having gum disease may have delayed immune response, and on the other hand, someone having an immune disorder may develop oral infections. Many diseases and conditions can affect the oral health adversely. For example, one may catch infections in the mouth easily if one’s immune system is weak. The immune system is the defense system of our body and it protects from illness and infection. It can become weak in case of disease, infections or as a side-effect of certain medication. Certain medication may also have an impact on the health of mouth. For example, some drugs cause dry mouth, which increases the chances of dental decay and infections. While examining one’s mouth, a dentist may see a sign or symptom of a disease much before any overall symptoms of that, and this may enable him to perform tests to reach a conclusive diagnosis and/or refer the person to a specialist for treatment. Oral health also can affect other medical conditions. For example, in case of a diabetic, a mouth infection can interrupt with the blood-sugar levels and can make diabetes harder to control. Researches have also found that gum diseases increase the risk of various medical problems as serious as heart diseases. As per the national oral health survey in India (2002-03), as many as 80% of people above 35 years of age had some form of gum diseases. Because gum diseases are so common, its treatment and timely management can have better results for overall well-being. 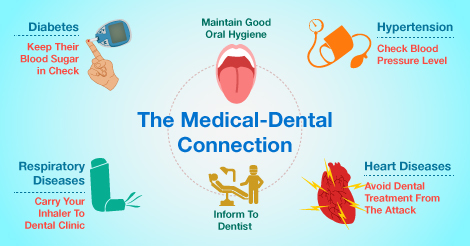 Maintaining good oral health is definitely a preventive practice for the entire body, and an effective line of defense from conditions as serious as heart diseases.